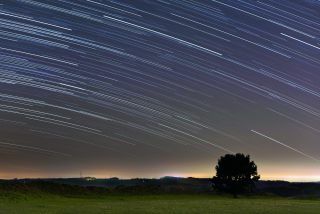 Star trail photos, with moving stars forming streaks of light across the night sky, are always popular. In this tutorial, we’re going to walk you through how to shoot source images for a star trail photo, and then how to merge them in Lightroom. If you’re in the northern hemisphere, you’ll need to aim for Polaris, the north star, to achieve the classic ‘circular’ star trail look. If you’re in the southern hemisphere, you’ll need to find the south celestial pole. A big part of photographing the night sky successfully is having low light pollution and clear, cloudless skies, so first we had to do a bit of research to find a really dark sky, and a clear night on which to photograph. The Brecon Beacons, in South Wales, became only the fifth International Dark Sky Reserve in the world back in 2012, and prides itself on having extremely dark skies. This made it the perfect location for us to photograph our star trails. The weather in Wales is notoriously changeable, so we kept a close eye on the forecast and made sure we were all packed up and ready to go as soon as an opportunity presented itself. Your eyes have two types of light receptors: rods and cones. Rods are used in very low light but do take a while to adjust to darkness – typically 15 minutes or so. They are also extremely sensitive; all it takes is a brief burst of light and the clock is reset, and you have to wait another 15 minutes. The good news is that rods can’t detect red light, but cones can, so if you use a red light at night, you’ll be able to find your way around without ruining your night vision. Check the light pollution and the weather before you go, and pick a location that will be clear of clouds and unwanted lights. Wrap up warm. Your camera also feels the cold, so take a towel or hand warmers to wrap around the lens and avoid misting. Bring a pocket light, and make sure it’s red or has a red filter. Using a red light will help you keep your night vision. Get set up to compose your scene. This will be difficult in darkness, which is why recceing the location beforehand is important. No stars sit as perfectly in the south as Polaris does in the north. To locate the south celestial pole, find the Southern Cross and draw an imaginary line from the top to the bottom, and then extend it about four times. Compose your photo with Polaris in the centre (for circular shapes) or off to one side for beautifully curved star trails, as in our shot. To find Polaris, take a compass reading to locate north, then aim your camera in that direction and slightly up, and look for the brightest star. You can find true north even if you don’t have a compass. You will need to know at least one constellation, though, and that’s Ursa Major (The Plough). Find the end of the ‘pan’ part of the shape (see above), then plot an imaginary line up from the edge of the pan to the very next bright star. We used a bungee cord to tie our bag to the tripod to stabilise it in the windy conditions. When shooting long exposures, keep the camera as still as possible. Anything you can do to steady the camera is a good thing. A bungee cord takes up little space and is worth throwing in your bag. The AF system won’t have enough light to focus properly so you must focus manually. If there are distant lights, focus on these, then recompose. If not, get a friend to stand 40 to 50 feet in front of the camera and point a light towards you, focus on the light, then recompose. Keep your lens warm to prevent it misting up as the night gets colder. We wrapped our lens with a heated hand warmer and a small towel, with a rubber band to hold it around the barrel. Be careful not to knock the focus ring when wrapping your flannel around the lens barrel though. Set your lens to its widest aperture. The stars are so far away a shallow depth of field won’t make any difference to the focusing of the shot. Set a shutter speed of between 20 and 30 seconds at ISO 200 and take a test shot. If your shots are too dark, increase the ISO. If your location suffers from light pollution, try the ‘expose to the right’ technique. Take a shot and check the histogram: you want the graph to stack up to the right-hand side, but without clipping. This should allow your sensor to capture more detail. You can correct the exposure in post-production. Open the intervalometer setting in your camera’s menu. If your camera doesn’t have this feature, use an external intervalometer to set the number of shots. The number will depend on how long you want your trails. We set 200 shots at an exposure time of 30 seconds each. If you find your images do have lots of noise, don’t worry because you can reduce this in Lightroom. Go to the Develop module, and in the Detail panel (at the bottom-right of screen – you may have to scroll down), under Reset Noise Reduction move the Luminance slider up until the noise is acceptable. Go to File>New Catalogue. Name your catalogue Star Trails and click on Save. The (empty) Library window will open up. Navigate to your images, select them all, press Cmd/Ctrl + A, and drag them onto the grey import area. Click on the import button in the window that appears. Move to the Develop module. On the right hand-side you’ll see the tool panel. Starting from the top, switch the white balance to Tungsten, to alleviate the light pollution. Add fill light to brighten the midtones, and then increase the vibrance to boost the colours without clipping them. Select all the photos in the filmstrip by going to Select>All and clicking on the Sync button. Tick Check all before clicking on Synchronise, and these adjustments will be applied to all the selected images. Click on Edit, then choose Photo>Edit In>Open As Layers in Photoshop. The images open on separate layers. Drag the first image you took to the bottom and set blending mode to normal. Select the top layer, change the blending mode to Lighten, then right-click and pick Copy layer style. Go to Select>All layers, right-click on any layer and pick Paste layer style. If you have any aeroplane light trails, or extraneous light leaking in, add a mask to the layer in question, grab your Brush tool (press B) and paint with black to eliminate the distraction. Be careful not to brush out the stars as well, as this will result in gaps in the star trails themselves. You’re nearly done. Now you just need to save the image. Go to File>Save As and choose a suitable file type – JPEGs are usually the most useful. Give the picture a file name and click on Save. Your image will export, giving you the final photograph.